No relation to Chuck, the Jan Hagel is as fun to make as it is to say (Yahn HAHgle). 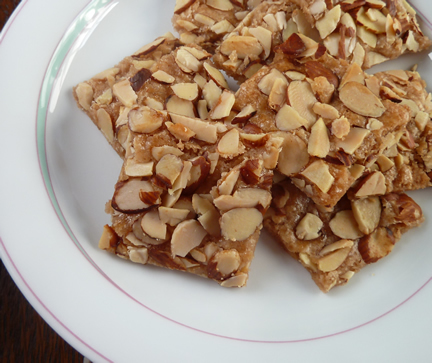 This traditional Dutch Christmas cookie is a crispy melt-in-your-mouth delight with cinnamon and toasted almonds. Curiously, this cookie makes me think of my college orientation week. A day in Harvard Square was on the schedule, including an exciting “Dutch Treat” lunch. Imagine my surprise when we ended up at the Wursthaus, a legendary spot with fabulous schnitzel, but no Gouda or Edam. I suppose I might have figured it out if it had said we’d “go Dutch,” but I was a teenager who didn’t get out much. Two years later, I had my first Jan Hagel cookies, coincidentally from a Harvard Square shop, finally fulfilling that Dutch Treat promise. They became a favorite in college, so when I saw this simple recipe in the Land O’Lakes Cookie Collection cookbook a few years ago I had to make them. They were even better than I remembered. This became an official recipephany when my Chinese friend Angela liked them so much she asked me to show her how to make them. I felt honored, since she grew up where desserts are quite different from ours, and where cooks pass on recipes by demonstrating techniques rather than writing them down. So I held my first baking class in my tiny kitchen—with the perfect student. Angela now bakes these frequently and with great success. So when she told me recently that she looked for but couldn’t find the recipe on recipephany.com, I knew the time had come for this post. Heat oven to 350°. In a large bowl, combine flour, sugar, butter, egg yolk, cinnamon, salt and vanilla. Beat at low speed, scraping bowl often, until well mixed, 2 to 3 minutes. Divide dough into halves. Put each half onto an ungreased cookie sheet. Cover the dough with wax paper and use a small rolling pin to form a rectangle 1/16-inch thick. If you prefer, press it out with your hands. Remove wax paper. In a small bowl, beat egg white with a fork until foamy. Brush over dough, then sprinkle with nuts. Bake for 12-15 minutes, or until very lightly browned. Immediately cut into 2-inch squares and transfer them to a rack. Cool completely. Store in an airtight container. Makes 3-4 dozen squares.